Have you ever read a book and thought ‘Everyone should read this book!’ Who Am I? 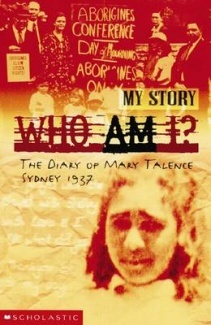 The Diary of Mary Talence, Sydney 1937 was one of those books for me. Mary was taken to a Bomaderry Aboriginal Children’s Home when she was only five-years-old. Now, at 10, she is living with a white family in Sydney, trying to learn how to fit in and wondering where she truly belongs. Author Anita Heiss shares Mary’s story through diary entries over one year, from 27th January 1937 to 27th January 1938. This is an eventful year for Mary, as she moves from the Home to her new family and as she finds out about the growing movement of activists fighting for the rights of Aboriginal people. The Stolen Generation is a chapter of Australian history that is difficult for adults to comprehend, let alone children. Through Mary’s wonderful voice, this book manages to share some of the impact of The Stolen Generation without becoming weighed down by the politics and human rights issues that, while central to the actual event, can be too confronting or difficult to understand for younger readers. Instead, Heiss shares the events of 1937 through the eyes of a 10-year-old girl. We hear about the everyday friendships and activities of a young girl – her wonder at a trip to Taronga Zoo and enjoyment at attending a friend’s 11th birthday party – as well as her growing awareness that the colour of her skin sets her apart in the eyes of many. We find out about school and home life in the late 1930s as we learn about the Aboriginal Day of Mourning and protests on Australia Day 1938, the 150th anniversary of white settlement, asking for Aboriginal citizenship and laws ensuring access to education and adequate care. The experiences of The Stolen Generation are confronting and difficult to explain, but that doesn’t mean we shouldn’t offer our children the opportunity to learn about this aspect of our history. I have recommended this book numerous times to friends for their children and teachers for their classrooms. I think this is a book that all Australians should read, children and adults, and I know that it has helped me to better understand an event in our country’s history that is often overlooked in mainstream historical accounts. Who Am I? The Diary of Mary Talance, Sydney 1937 is one of the titles in the Scholastic My Story/My Australian Story historical fiction series.